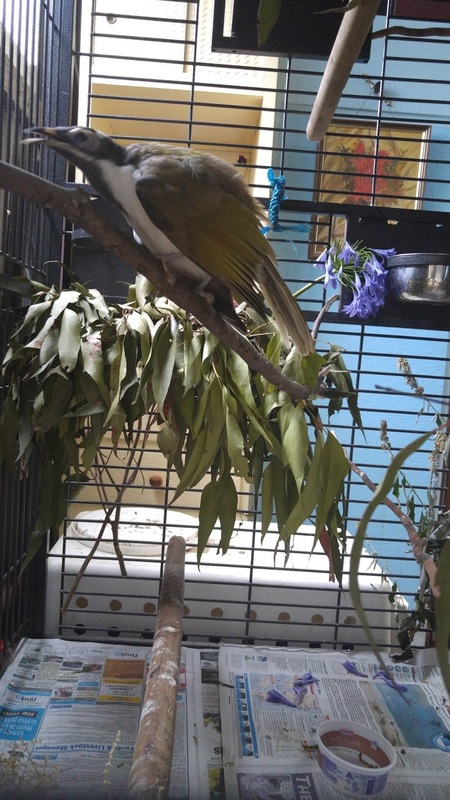 Barry came to us from the little girl next door; she rescued him from a group of noisy miners who were beating him up after he fell or flew from his home nest. His parents were nowhere to be seen so she bought him to us. He is living with us until he learns to feed and defend himself, then he will be free to go where he pleases. The usual progression with social birds is that they hang around the humpy, getting the odd free feed when times are hard until they meet a group of their own kind and head off with them (kind of like teenagers). 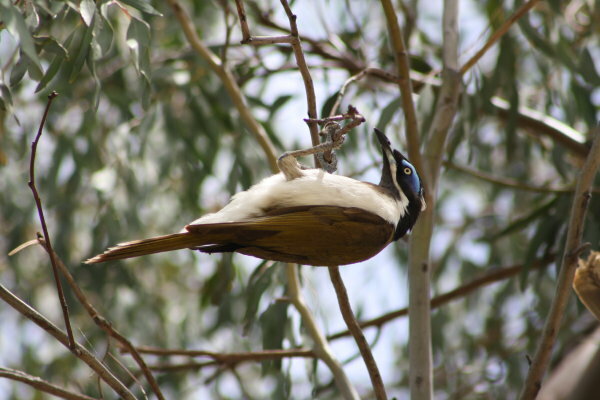 Blue faced honey eaters are a social sedentary species who eat insects, nectar and pollen. They are like a large family gathering; loud, hilarious and lots of arguments. The adults have a brilliant blue around the eyes (very 70s disco queen) but juveniles have a greenish tint around the eyes, they aren’t allowed to wear eye shadow until they are about one year old. Barry is a little camera shy, but you can see his greenish eye shadow. Barry is a late sleeper, often not waking up until well after I have fed all the outside animals, he sits with his head tucked under his wing and mutters curses at me if I poke him (gently). Once awake he demands breakfast in a loud squeaky voice until I give him some honey eater mix and meal worms. He is a playful little fellow; hanging upside down on his branches, flying in tight formations in his cage and fossicking under the newspaper on the cage floor for lost meal worms. 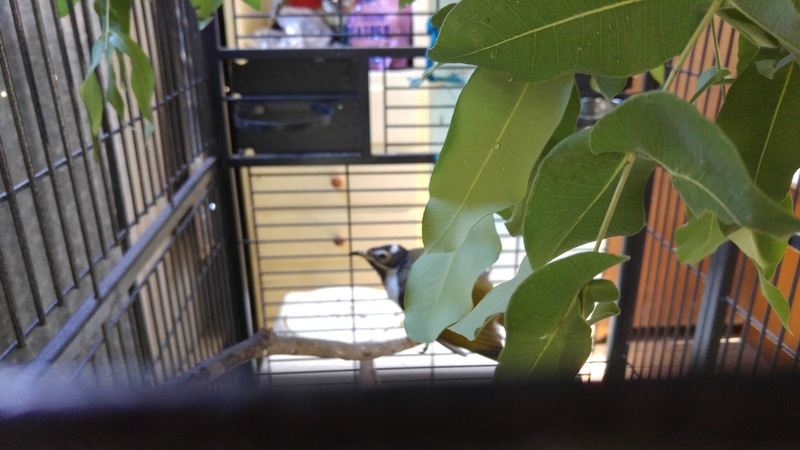 At the moment he is spending part of each day out of his cage, flying around the humpy. Soon he will decide it is time to go out into the big world and explore the trees flowering around the place. This is the danger time for release birds as it is easy for them to go too far and get lost or be taken by a predator. We can’t keep them in cages forever though, they are mean’t to be free. It is with mixed feelings of joy and trepidation that I watch each one learn to live independently (much as I felt when my kids went off to uni) but most times it is joy that wins out. 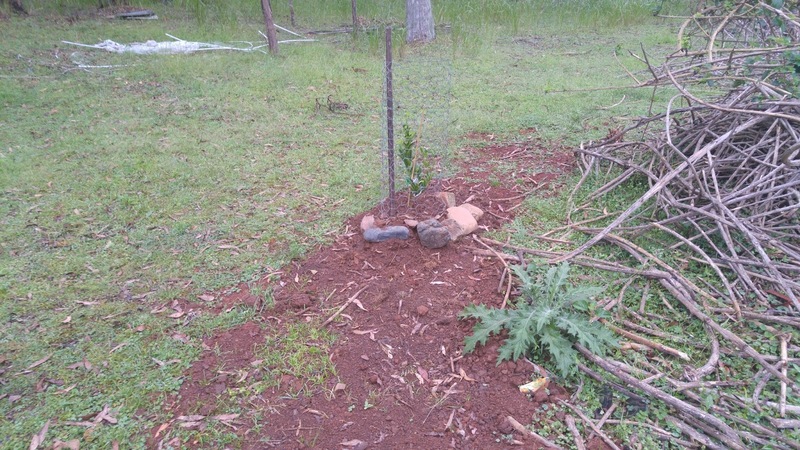 On an unrelated subject, we planted a tree on Shaun’s grave. It’s a mandarine and every time I pass it I think of my little mate. Very lovely. There's so much personality in all of the animals. You are so right; all animals have their own personality. Some of us notice, some of us don't.